"Come away, O human child! This quotation opens writer/director Tomm Moore’s 2014 film Song of the Sea, which is one of the most beautiful family movies ever made. Like his previous movie, 2009’s The Secret of Kells, it’s a visually gorgeous movie to look at, is steeped in Irish folklore, a terrific voice cast, and has wonderful music as well. Both were nominated for Oscars for Best Animated Film, and I think Song of the Sea should’ve won (Kells, sadly, was up against tougher competition). 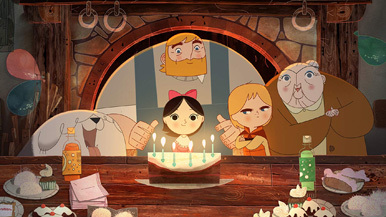 It’s gentle, not full of the manic energy many filmmakers think a children’s movie needs, and ultimately tackles the deep themes of grieving, sibling rivalry, family love, and much more wrapped up in a wonderful adventure tale with lovingly created 2D animation. The story concerns Ben (David Rawle), a young boy who is antagonistic to his mute little sister Saoirse (pronounced Seer-sha). They live on the Irish coast, at a lighthouse with their father, Conor (Brendan Gleeson), who is distant but loving. The reason Ben is angry at his sister is because they lost their mother, Bronagh (Lisa Hannigan), at Saoirse’s birth. This is also the reason that Conor is so distant, still working through his grief at losing his beloved wife. On Saoirse’s 6th birthday, the family is visited by their Granny (Fionnula Flanagan), Conor’s mother. That night Ben scares Saoirse with the myth of Mac Lir and his mother Macha, the Owl Witch, who took his feelings and turned him into stone. Ben tells Saoirse that it’s just a story their mother would tell him, but Saoirse takes it much more to heart than Ben does. Saoirse later finds a seashell horn that their mother had given to Ben, and by playing it, is led to find a small seal-skin coat in Conor’s closet. She puts it on, goes outside (hypnotically following magical lights that seem to live hidden in the air and answer the call from her horn whenever she plays it), and wades into the sea, surrounded by seals. She dives down into the water, finding out that she is a Selkie, a creature of Irish myth that can turn into a seal when in the water, and back into a human by shedding its skin on dry land. After her magical swim, she’s found washed up on shore by her Granny, who then convinces Conor to let her take the children into the city to live with her. She says that the sea is dangerous and is no place for the children. So she drives them into Dublin, and away from the things they care about the most. Ben is separated from his huge sheepdog Cu, who Granny says is too big to live in the city. Saoirse is taken away from the ocean, and the seals that feel like a mysterious home to her now. Neither child will stand for this exile and immediately escape from Granny’s care into the night.